A special service was held on Sunday 11th February 2018 at St Joseph's Church. 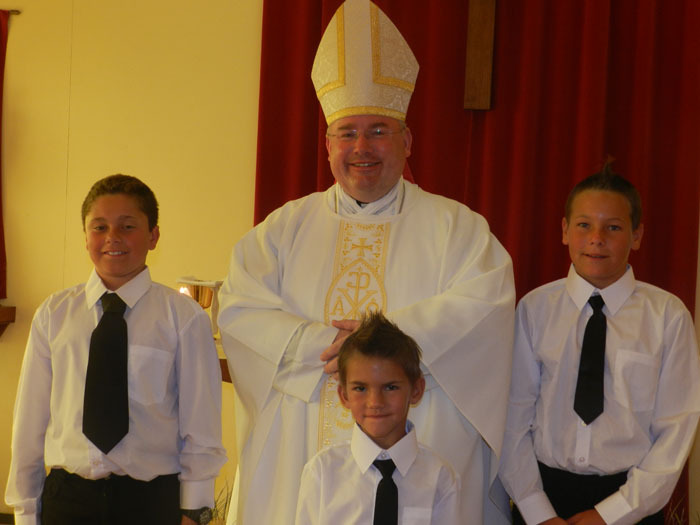 First Holy Communion for Connor Glass-Green and Confirmation for Kieran Glass and Ryan Swain was administered by Father Abbot Hugh Allan. The banns of marriage were also called between Steve Swain and Sasha Green who plan to marry on the 2nd March. Abbot Hugh is the Apostolic Administrator for Britain's South Atlantic islands, and is visiting his Tristan flock for a few weeks. 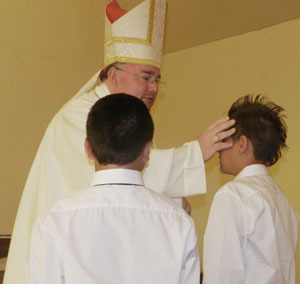 Right: Abbot Hugh confirming Kieran Glass (right) and Ryan Swain.